Want to learn to write more powerfully? Um, is Italy in the spring wonderful? Well, Marcia Riefer Johnston has just the book to learn how to do it. What I loved so much about Word Up! is that it's so entertaining, that bettering your prose is almost effortless. I'm thrilled to have Marcia here on the blog. Thank you, Marcia! Why are good grammar and punctuation your mission in life? Grammar and punctuation are to me what engines and transmissions are to car lovers: mechanisms behind the magic. Just as a car maker needs to get hundred of parts working under the hood to create an enjoyable ride, a writer needs to get lots of things working behind the words to create an enjoyable read. Grammar and punctuation. Rhetorical devices. Style guidelines. Logic. Structure. Rhythm. Sound. Meanings and connotations. A clear purpose (the answer to why am I writing this?). An understanding of audience (who will read this? what will they want or need or wonder about or respond to?). A sense of readers’ situations (where and how and when will people read this?). Open-mindedness. Persistence. A brilliant novel, billboard, or love letter doesn’t just roll out of someone’s head any more than a Rolls-Royce does. If I have a mission regarding grammar, punctuation, and all the elements of masterful writing, it’s to inspire and help equip writers—how shall I say it?—to tune up their engines (Listen! You can hear a certain hum when all the parts are oiled and working together), to clear out their cars (Toss out those stray apostrophes like so many empty food wrappers), and, then, to invite their readers to hop in for a ride to remember. What I love so much about the book is the easy-to-remember tips and tricks. Are these from your own hard-won experience? Yes and no. 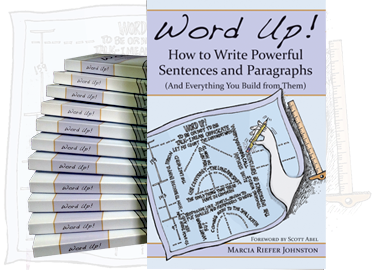 No, the tips and tricks in Word Up! don’t belong to me. I haven’t figured out anything new. Aristotle said it all two thousand years ago, and writers have been repeating his wisdom ever since. But in a way, yes. After years of reading and writing (and rewriting and rewriting), I’ve arrived at my own sense of what works and why. I’ve discovered what a difference these tips and tricks make. I wrote the book because I’ve discovered that many writers haven’t yet made the same discoveries. What's the best way for anyone to read this book? Skip around? Start to finish? Skipping around works. The chapters are short and self-contained. You could think of Word Up! as a bathroom book: pick it up, and follow your interests. A few minutes here, a few minutes there. Ideally, as with most bathroom books, you put it down with a smile. Next time you pick it up, you can start anywhere. A straight-through reading works, too, because the three main sections increase in complexity—in “chewiness” as one friend puts it. But the topics aren’t cumulative. You don’t need to read Chapter 1 for Chapter 2 to make sense. Can you talk about some of the rules that really aren't rules at all and why we persist in still following them even when they don't serve us? Many people were taught that it’s wrong to end a sentence with a preposition, wrong to start a sentence with and or but, wrong to use passive voice, wrong to use sentence fragments. Like this. I’m not saying that prepositions belong at the end, or that sentences should start with and, or that passive voice is good, or that fragments rock. Here’s the point: strong writers use discernment in these things. Why do we persist in following these “rules” even when they don’t serve us? The fear of being wrong keeps us from doing many things. Writers who want to grow can start by letting go of that fear. Teachers, think handouts. One less thing you have to do. I know how challenging it is to teach writing—and how important. Students who write well, think well. The world can’t have too many capable thinkers. What was the biggest eye-opener in writing Word Up? The importance of feedback. If I had published this book two years ago when I thought it was ready, I wouldn’t be answering interview questions right now. Lucky for me, my husband encouraged me to send that early manuscript to everyone I could talk into reading it. The thoughtful, wise, honest, generous, insightful feedback I received transformed this effort into something I never could have done alone. Every reader's perspective contributed. Feedback helped me get this book’s engine purring and its chrome gleaming. At least that’s how it feels to me. Thanks to a crew of helpers, this baby’s raring to hit the road. Let's take 'er for a spin.